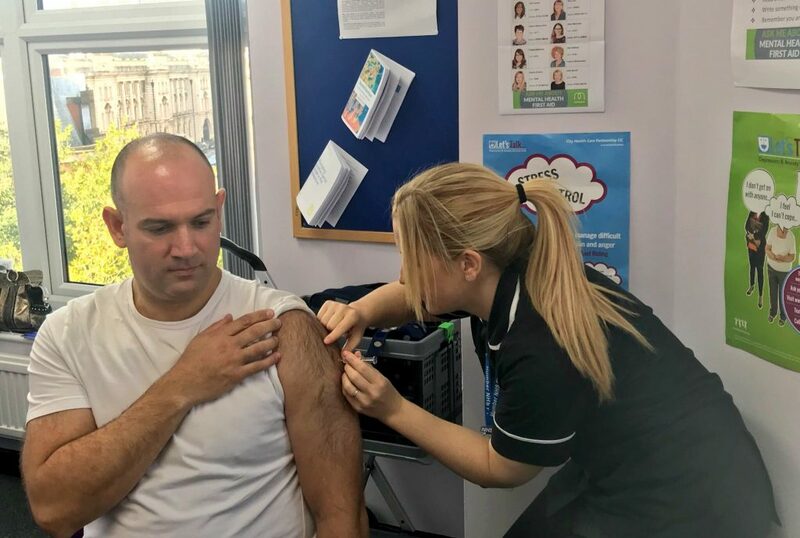 Dr James Crick, Consultant in Public Health Medicine and Associate Medical Director, works across Hull City Council and Hull CCG, having his flu vaccination earlier this winter. Last year, across the wider Yorkshire and Humber area, more than 300 people were admitted to intensive care units after catching flu; we are starting to see increased hospital admissions for patients with flu-like illnesses in Hull. Eligible adults are encouraged to get their free vaccine from their local general practice or pharmacy to protect themselves and their families before flu reaches its seasonal peak. It is the single best way to protect against a potentially very serious illness. Dr James Crick, Consultant in Public Health Medicine and Associate Medical Director, works across Hull City Council and Hull Clinical Commissioning Group (CCG). He said: “We can’t emphasise how important it is for those people eligible for a free vaccine to take up that offer. You’re protecting yourself and those around you from an illness which is seriously debilitating and capable of putting you in hospital and, at worst, can be fatal. Be the first to comment on "It’s not too late to get a free flu jab"